It’s the latest holiday tearjerker. Zain Al Rafeea takes care of business on the street in Capernaum. Zain, the young protagonist of Nadine Labaki’s Capernaum, may be only 12 (he’s not exactly sure of his age) but he has star quality that makes him stand out in his Beirut neighborhood. Quite simply, he’s a beautiful kid, with a face that looks like the young Alain Delon and has the hustler’s gift for turning every exchange of words to his advantage. Zain (played by non-actor Zain Al Rafeea) has every need for such persuasive powers. His home is a den of thieves. At Zain’s family’s crowded apartment in a firetrap building, his derelict alcoholic father Selim (Fadi Yousef) and his bitter, scheming mother Souad (Kawsar Al Haddad) spend most of their waking hours squeezing a living from every opportunity that walks by unawares — and they expect their kids to do the same. Zain does odd jobs in shops, steals useful items, and sells homemade pharmaceutical “special juice,” with always one eye out for predators. Everywhere there are pederasts, coming on to the fresh-faced, foul-mouthed boy. Perhaps most dispiriting of all is Zain’s need to disguise the fact that his innocent younger sister Sahar (Haita “Cedra” Izzam) is finally getting her period. Zain knows that means their parents will try to pimp her out to their perverted landlord in exchange for rent. Meanwhile, on the street, Zain makes the acquaintance of a green immigrant from Ethiopia named Rahil (aka Tigest, played by Yordanos Shiferaw) and her toddler son Yonas (Boluwatife Treasure Bankole), struggling to reach just the bottom rung of the ladder amid the relief orgs and shanty towns of refugee-choked, contemporary Lebanon. For them, in fact for Zain and everyone he knows, places like Turkey and Sweden take on the fairytale luster of faraway magical kingdoms. “Poor Kids of the Slums” has been one of the movies’ most reliable subgenres since the dawn of the motion picture image. When our Zain encounters such characters as Aspro the hideous fixer/human trafficker and the carnival’s Cockroach Man, he’s following a tradition that goes back before Charles Dickens, all the way to the Bible. 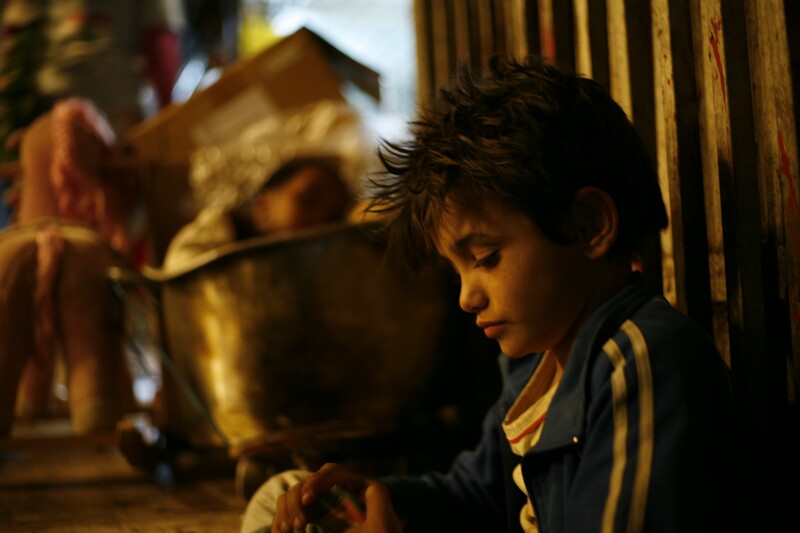 Zain’s wretched Christian slum in Beirut is no more reprehensible than the childhood purgatories of England (Oliver Twist), Brazil (Pixote), Mexico (Los Olvidados; Amores Perros), India (the Apu trilogy; Lion), or the United States (last year’s Night Comes On). And yet actor-turned-filmmaker Labaki labors hard to stack up a mountain of sordid obstacles for little Zain to surmount. Capernaum makes the 2018 critics’ favorite Shoplifters look like an afternoon at Disneyland. Unlike the Artful Dodger or the other slumdogs, however, Zain has the 21st-century option of suing his parents in court for the crime of giving him birth into such dire conditions. In the screenplay by director Labaki — collaborating with writers Jihad Hojeily, Michelle Keserwany, Georges Khabbaz, and Khaled Mouzanar — it is made plain that the diminutive Zain is the righteous leader of his disastrous family. And when he forms a seemingly unbreakable bond with the baby Yonas after the toddler’s mother gets caught up in the system, anyone can see that it’s Zain’s way of showing the world how a family ought to operate. The entire cast is made up of non-professional first-timers, with Al Rafeea’s Zain leading the way. The kid’s next meal depends on the success of his sales pitch. According to the press notes, the director often followed her young “star’s” improvisations while filming. He essentially plays himself. Special praise also to Al Hadda as Zain’s seemingly unredeemable mother, whose impassioned speech to the judge puts this sad story in an uneasy wrapper. No one ever sets out deliberately to become a child abuser or a murderer, nor a victim. But it happens in Beirut, and Oakland too. And Zain is not alone.